About the author and her organization: Julia Sutton is the Executive Director for the Eastern Georgian Bay Stewardship Council (EGBSC). Georgian Bay Forever (GBF) helped the EGBSC with their 2 year project to assess the quality and quantity of fish habitat available to populations of Walleye, Lake Sturgeon, and Sucker species in 8 tributaries of Eastern Georgian Bay within Parry Sound due to declines of these species in certain areas. A purpose of this study, was to identify spots for remedial action. The Shebeshekong River was one tributary that was analyzed, and during the course of the analysis, the EGBSC identified that there were problems that were preventing Walleye from reaching ideal spawning locations on the river and that restoration was needed. Read about the action taken to help these fish. The Shebeshekong River watershed is a fairly small catchment area, beginning at Shebeshekong Lake and meandering for 15km before reaching Georgian Bay. Historically, Walleye and Sucker species from Georgian Bay would swim up the river, past the first two sets of rapids (Dillon and Young’s), and spawn in rapids farther upstream. Changes were made to Dillon and Young’s Rapids many years ago, in order to make it easier to drive logs down the river. Because of these changes, it has become more challenging for fish to swim upstream to historical spawning areas. 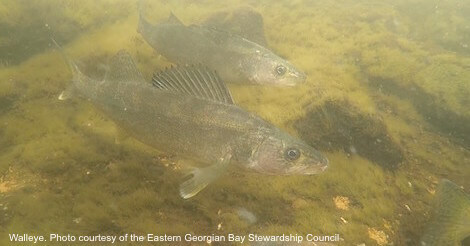 The Eastern Georgian Bay Stewardship Council (EGBSC) identified fish passage and spawning issues in the Shebeshekong River during a site visit in 2015, as part of a fish habitat project on eight rivers in eastern Georgian Bay. The Ministry of Natural Resources and Forestry (MNRF) and local residents had already done restoration work at Dillon Rapids in the 1980s; however, challenges have remained, and the number of Walleye moving up the Shebeshekong River to spawn has been declining over the last several years. During EGBSC’s study of the Shebeshekong River in 2016 and 2017, very few Walleye were seen during spawning. EGBSC did see Walleye at the bottom of Dillon Rapids, but not upstream. No Walleye were seen at Young’s Rapids. There is some Walleye spawning that occurs at Dillon Rapids, but this area is vulnerable to changes in water levels. As water levels recede, many eggs in the nearshore areas are left out of water and dry out before hatching, even in years with higher water levels. It is for this reason that EGBSC chose to restore fish passage through Dillon Rapids, as opposed to adding more spawning habitat. There is better spawning habitat farther upstream of Young’s Rapids, and fish used to use a side channel to get to those areas. This channel had filled in over time, after the rapids were changed for the logging industry. EGBSC worked with Biotactic Inc., a fish and wildlife research consulting firm that specializes in fish passage, to develop a restoration design. EGBSC and Biotactic assessed fish passage and use through aerial photo comparisons, collection of water flow measurements, water depth changes, visual observations for fish (day and night), use of egg mats to understand if and where eggs were being deposited, underwater infrared cameras to record fish, and gathered information from local residents, community members from Wasauksing First Nation and Shawanaga First Nation, and others that are familiar with the site. In the fall of 2017, EGBSC completed restoration work on the Shebeshekong River based on Biotactic’s recommendations. The goal of the restoration project was to slowly increase the number of Walleye that spawn in the Shebeshekong River in the years to come by restoring their access to the spawning habitat they historically used. Local resident and rock demolition expert, Terry Christenson, leant his time and expertise to improving a bypass channel within Dillon Rapids that had been started by MNRF. A large boulder was installed at the top of the rapids to help focus water flow onto the east side of the rapids to improve depth for fish passage. At Young’s Rapids, the side channel was restored to help Walleye and Sucker species move upstream. This channel was designed to run only in the spring spawning season and times of higher flows, so as not to interfere with the river’s regular flow. After the channel was dug, the sides of the channel were covered in a biodegradable coconut husk fabric to protect the banks and minimize erosion. One hundred native wildflowers, ferns, shrubs and trees were planted along the banks to stabilize the site after the construction. EGBSC and Biotactic will be monitoring the restoration work over the next several years to ensure it is working as intended and make any necessary modifications. Volunteers were involved in all aspects of the project, where possible, and Biotactic was on-site to guide the restoration work. Many people gave their valuable time and expertise to complete this project. EGBSC would like to acknowledge and thank local residents, Terry Christenson, Biotactic, members of Wasauksing First Nation, Shawanaga First Nation, and the amazing volunteers that assisted with project. This project would not have been possible without funding from Bruce Power, the Government of Ontario and the Government of Canada. Read about the goals of the EBSC's fish tributary assessment project. Learn more . Georgian Bay Forever collaborates with Georgian Bay organizations, communities, municipalities, researchers and so many more to analyze threats and problems to the health of aquatic ecosystems. We work together with these partners to find and carry out solutions. To learn more about some of the partners we work with, please visit our partners page. We also work with a lot of communities and individuals around the Bay on wetland restoration by removal of invasive Phragmites. Learn more and find links to some inspiring stories at this link. Learn about DNA barcoding. A system to catalogue all the biodiversity in The Bay in order to protect it. Link. Find out about an underwater drone that could help revolutionize water quality monitoring and help construct a detailed and precise map of the state of underwater coastal shoreline habitat Link. Please donate to Georgian Bay Forever! Every donation is so important to us to continue partnerships, projects, and education efforts that help protect the water of Georgian Bay. Learn about good fishing practices from the EGBSC. Link to Walleye Woes.